Animals occasionally require shots – maybe a routine vaccination, pain medicine, or antibiotics. Avoid shots if other methods are available (for example, using a pour-on dewormer vs. an injectable dewormer). The type of shot to give depends on what is being given. IM: Intramuscular injections are injections put into the muscle of the animal. 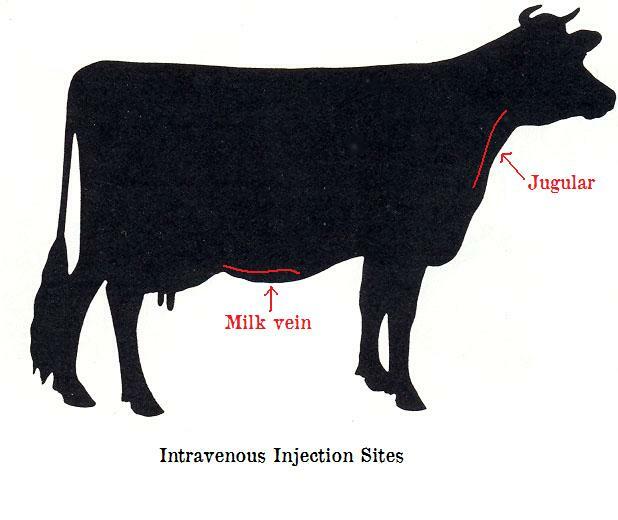 IV: Intravenous injections are into a vein, such as the jugular or milk vein. Acts almost immediately. SubQ: Subcutaneous injections are under the skin. For slow release or irritating medicines. Intramammary: Inserted into teat end, through teat canal, to reach “mammary” tissue – inside one quarter of the udder. Slow release behind ear: For long term medicine, performed by vets. NEEDLES: Use only STERILE needles! Throw away after using once. Gauge: The smaller the number, the larger around the needle. IM: Use 16 gauge for cow; 18 gauge for calf under 300 pounds or when giving thin liquids; 20 gauge can be used for calves when injecting thin liquids. Intramammary: Mastitis tubes come with a blunt end plastic needle tip called a cannula. Intramammary: Tips are around 2 inches long, to reach past the length of the teat canal. IV: Large doses may be given. For example, one bottle of Calcium is 500mL (500cc) and more than one bottle (perhaps Calcium, then Dextrose or Saline) can be given at that one injection site for a cow. Ratio for calf would depend on treatment needs. If you need to give more than the above doses, you can separate the dose by location. 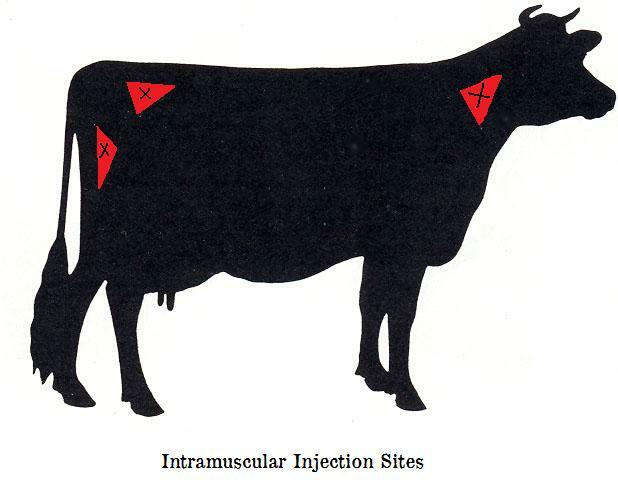 For example, 20 cc of IM injectables could be split between each side of the neck: 10 cc on the cow’s right side and 10 cc on the cow’s left side of her neck. Intramammary: One tube per quarter. INTRAMUSCULAR: In the neck (right picture) is a popular place to give IM shots. – Especially for meat animals, to avoid giving a shot in a good “meat” area of the rump. Sub Q injections are given by lifting up the pliable fold of skin behind or in front of the shoulder and inserting the needle to inject under the skin without going into the meat. 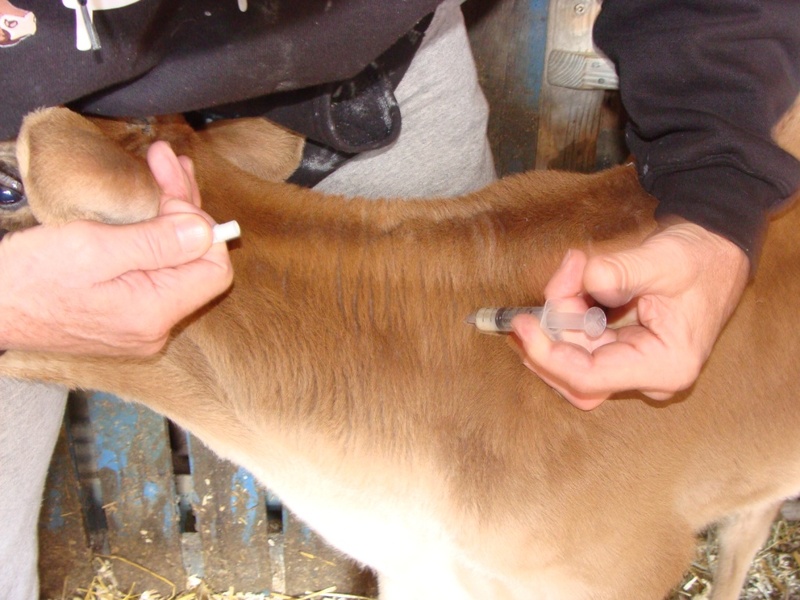 Photo from FAO website illustrating sub Q administration of injection. Click photo to go to website. IV injections are most often used for sick cows. More detail for giving IV shots can be obtained by reading the section on how to give an IV. Pre-warm the tube(s) in warm water to soften the oils for easier application. Properly clean teat end(s) and scrub one teat end per one alcohol swap. Insert cannula tube into end of teat and gently navigate through the teat canal. You may need to push and compress the length of teat in order to reach into the gland area. Once past the teat canal, push to dispense medicine. Use your hand to work the medicine from the bottom of the quarter of the udder upward. Massage upward fairly firmly & several times to disperse medicine throughout the quarter. Remove cannula tube from teat & seal end with teat dip to protect. size knot came under his skin. I massaged the area for a few seconds after giving him the shot. If the softball knot happens immediately, then you’re giving too much fluid in one subQ spot, although most vaccinations are quite small and a single shot location should be just fine. If the knot appears later, then my explanation above about hitting muscle is probably more applicable. The knot could potentially burst (TMI, I know, but thought I should mention it!) but most often they will just gradually reduce in size and completely disappear. If you are concerned it is growing, you should probably contact your vet to talk the situation over.